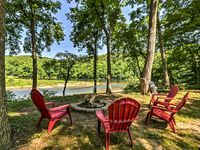 Property 16: Fall Creek Cabins family friendly 1 mile from Lake Norfork and Mountain Home Ar. Earth Home Retreat - Light Cottage #5 - A View and Footpath to the Lake! Property 26: Earth Home Retreat - Light Cottage #5 - A View and Footpath to the Lake! Property 40: NEW! White River Cabin w/Decks, Game Room & Views! Property 45: NEW! White River Fisherman's Lodge w/Guided Trips!